Just look at this cover! And I thought it was a good idea to read this by myself at night? When I was one day old, on November 13, 1974, halfway across the country Ronald DeFeo shot and killed his parents and four siblings as they slept. He did this in a place called Amityville, New York, in a house at 112 Ocean Avenue. We now recognize this story as “The Amityville Horror,” a best-selling book of 1977 and the basis of 1979 movie starring Margot Kidder and James Brolin and the 2005 remake. For some interesting background information on the actual murders, read the Wikipedia page. There’s even some mystery as to how DeFeo could have carried out the six murders. I also was unaware of this recent documentary series on the murders. “The Amityville Horror” was one of those true crime/paranormal books that completely fascinated me—the type of book I write about in my memoir. “The Amityville Horror” scared the crap out of me! Every time I saw a fly buzzing around the house on a cold day I was convinced it was evidence of paranormal activity. The voices, the black ooze running down the walls, the missing money, the imaginary friend that’s a pig, the mysterious red room in the basement—lots of unknowns, things that don’t have clear answers. 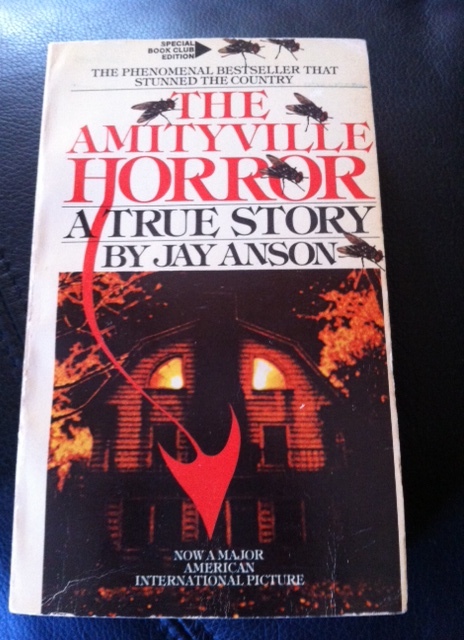 I clearly remember reading “The Amityville Horror” in 1987, when I was 12 years old. This was a few months after I had first dived into “Helter Skelter.” How do I know that I read the book in that year? I remember the day very clearly, and here’s why: Mom and Dad were gone to Dad’s 25th class reunion and they left me alone that night. In my infinite wisdom, I thought it would be a good idea to read “The Amityville Horror” at night while home by myself in the country. Never mind that a thunderstorm was brewing! I had just finished a chapter that ends with the cliffhanger of red eyes staring into a window at night when a huge bolt of lightning hit nearby, filling the house with a thunderous noise and knocking out the lights! I honestly cannot remember what I did after that. I just remember feeling terror. I can’t remember if the lights came back on shortly, or if I ran to my Grandpa’s house next door for company. That was the last time I would read a scary book by myself at home at night. Lesson learned! I know the story is supposed to be a hoax, but I choose to believe. If you believe ghosts exist, then it’s not out of the realm of possibility that the Amityville Horror could be true. It’s also not hard to believe that some kind of evil resided there, especially when you take a look at DeFeo’s murderous and cold-blooded actions. Was he possessed? And if so, by what? Could that thing, that entity, have always lived at that location? What do you think? Over on Fr. Ted Bobosh’s Web page we had a brief discussion (over a couple of his posts, if memory serves) about mental illness and demonic influence or possession. We might think as moderns that, with no psychiatry, demonic possession was just assumed in the case of the deranged, but it almost certainly wasn’t. I think even now there are acts or aberrations of mind that don’t get concretely explained by science or psychiatric theory. Maybe some evil entity was whispering to that young man. Or maybe he was just crazy. It doesn’t seem far fetched to me that some things may adhere to places or things too. Goodness knows I’d hardly want to buy a home where I knew some atrocity had taken place. At the very least that’s some bad mojo to have on the mind, knowing what happened in your home. Being born in November is a fine thing, by the way. I did it once myself. Happy Birthday! That’s really intriguing! I just figured people either believed demonic possession or mental illness. I didn’t think that there might be something in between. I lived briefly in a house in which a man had committed suicide in the basement. Of course I did not find this out until after Mom bought the house and we moved in! However, I never felt any kind of creepy presence but then again, as I note in my book, I don’t think I’m exactly gifted in the psychic realm 🙂 Maybe where evil exists it needs a particular person to be a vessel. Maybe I could have lived at 112 Ocean Ave. and not had a problem. But I wouldn’t want to test that theory! Thanks for the birthday wishes–same to you! Just this post was enough to give me the chills, Rachael. At least evidence suggests that you survived the night. That’s a good thing. But wow. I think I was so scared I blacked out! I just don’t remember the resolution of that evening! I thought “The Conjuring” was a very good movie. It had that classic horror movie feel, which I’m always looking for.